The two met today at the White House for about an hour and a half. President Barack Obama called his conversation today with President-elect Donald Trump excellent. "As I said last night, my No. 1 priority in the coming two months is to try to facilitate a transition that ensures our president-elect is successful," Obama said. "I have been very encouraged by the, I think, interest in President-elect Trump's wanting to work with my team around many of the issues that this great country faces. And I believe that it is important for all of us, regardless of party and regardless of political preferences, to now come together, to work together." This is the first time Obama and Trump have met face to face, according to a White House official. Their last interaction was at the White House Correspondents' Association Dinner in 2011, when Obama relentlessly mocked Trump, who had then been fanning the flames of the so-called birther conspiracy. White House chief of staff Denis McDonough was spotted with Trump's son-in-law, Jared Kushner, in the Rose Garden during the meeting. First lady Michelle Obama and future first lady Melania Trump met in the White House residence while their husbands sat together in the Oval Office. This was Melania Trump's first trip to the White House but not her husband's; he visited in November 1987 for a reception for members of the Friends of Art and Preservation in Embassies Foundation and in 1985 with his first wife, Ivana Trump, for a state dinner for King Fahd of Saudi Arabia. "Now, everybody is sad when their side loses an election. But the day after, we have to remember that we're actually all on one team. This is an intramural scrimmage. We're not Democrats first. We're not Republicans first. We are Americans first," he said. "We're patriots first. We all want what's best for this country. That's what I heard in Mr. Trump's remarks last night. That's what I heard when I spoke to him directly. And I was heartened by that," Obama said. "That's what the country needs — a sense of unity; a sense of inclusion; a respect for our institutions, our way of life, rule of law; and a respect for each other. I hope that he maintains that spirit throughout this transition, and I certainly hope that's how his presidency has a chance to begin," he added. 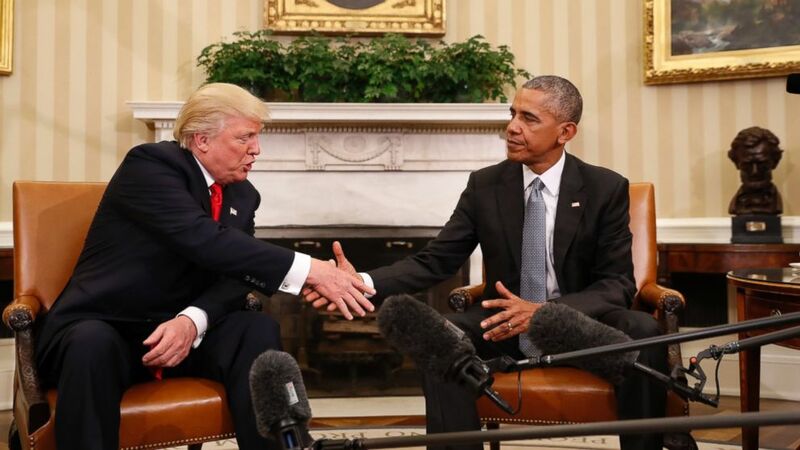 (Pablo Martinez Monsivais/AP Photo) President Barack Obama shakes hands with President-elect Donald Trump in the Oval Office of the White House in Washington, Nov. 10, 2016. During Wednesday's press briefing, press secretary Josh Earnest rejected the idea that the meeting would occur under an air of insincerity, given their criticisms of each other on the campaign trail. "I'm not saying it's going to be an easy meeting, but the president is deeply sincere about fulfilling this responsibility," he said.